Some people wonder why slow-speed parking lot practice exercises are meaningful given that they usually travel at much faster speeds when they are riding their bikes. Let me share with you an example that might shed some light on this question. A young man who was relatively inexperienced with motorcycle riding decided to make a 90 degree right turn from one street onto another. He was traveling at a speed substantially in excess of 35 MPH, but he claimed that he was certain that he could 'make it' if he just slowed down to 35 MPH before he gave it a try. Needless to say, he didn't. So why not? Was it just a matter of skill? The width of a standard lane in the United States is approximately 12 feet. In order to make the fastest turn you must select a path that provides the largest turn radius. Thus, you will want to carve a path from the outer edge of the approach lane, into as close as possible to the curb as your apex, then out to the outer edge of the new lane. 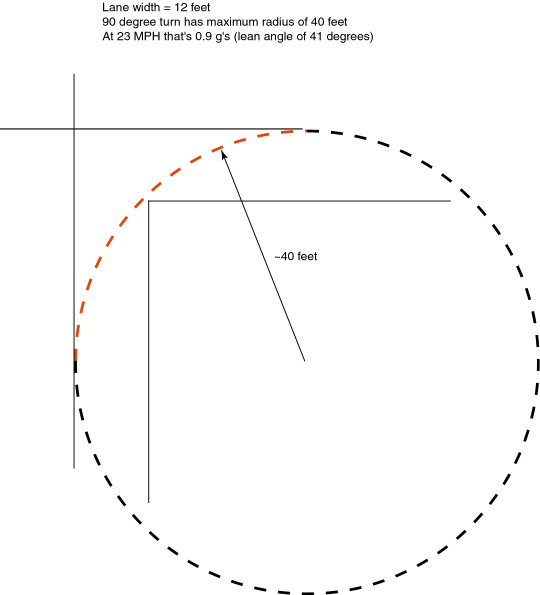 The largest radius possible is approximately 40 feet in this scenario. Observe that the fastest possible speed through that turn is about 23 MPH. That is about as fast as you ever go while doing parking lot practice. In order to make a tighter turn than that you MUST go slower. When you are practicing making U-turns you usually do it at about 10 MPH, no? 35 MPH is FAST! Making that turn at 35 MPH is an impossible task for the most experienced motorcyclist in the world, let alone a newbie.